When the Mellinger family arrived in Wayne County in 1816, it was mostly forest. There were hickories, walnuts, oaks and elms, as well as beeches, ashes, cottonwoods and maples. There were cranberries in low-lying bogs and also persimmons and pawpaws. Benedict Mellinger – born in Germany and raised in Lancaster County, Pennsylvania – was a weaver. He spun flax into light linens and wool into heavy blankets. For the past eleven years, he and his family had lived on a small farm 80 miles east in Columbiana County, Ohio. They had rented out most of the land to a neighbor and concentrated their labor on raising flax and sheep. When the family arrived in Wayne County, their first task was to clear a section of the forest for crops and pasture. Their few pioneer neighbors helped them to cut down trees and construct a log cabin. Until the leftover tree stumps rotted in the ground, the family planted their crops haphazardly among stumps and roots. They probably kept a few pigs, and let them wander in the woods to fatten on fallen chestnuts, acorns and beechnuts. New settlers – mostly fellow Germans from Eastern Pennsylvania – continued trickling into the area and together they formed a small community. Benedict Mellinger continued raising flax and sheep for textiles. The only roads connecting Ohio to East Coast cities were rough and frequently impassable. As a result, Wayne County farmers were cut off from established eastern markets. It’s likely that Benedict sold most of his coverlets and tablecloths to his neighbors. Over the next twenty years this would all change. On one hand, the cotton gin transformed the market for textiles. This machine dramatically reduced the labor required to clean and separate cotton fibers from their seeds and caused the price of cotton to drop. It also reduced the demand for fabrics like linen and wool, which were still labor-intensive and expensive. On the other hand, infrastructure improvements opened up vast new markets for Ohio farmers. The Ohio-Erie canal, completed in 1832, and the National Road, constructed and improved during the 1820s and 1830s, made it possible for Ohio farmers to access eastern agricultural markets with relative ease. During this transitional period, Benedict divided the property among his four sons. All four sons abandoned the dwindling market for linen and wool, and instead capitalized on staples like wheat, corn and butter that could be sold in the east. They also raised pigs, sheep and dairy cows, and grew oats, potatoes, hay and apples to feed their families and animals. They spun a little wool for home use, and churned nearly six hundred pounds of butter a year. Over the next three decades, commercial opportunities for Ohio farmers continued to grow. Train routes constructed during the 1860s made transportation even easier. Mechanical reapers and steel plows radically increased labor efficiency in the field. All together, the amount of grain that one farmer could both harvest and sell rose dramatically. By 1870, Christian Mellinger – the brother who inherited the main portion of the property – had doubled his production of wheat and oats. To get a sense of what this looked like on the ground, here’s what you would have seen if you walked around the Mellinger property in 1879: you would have gazed out over twenty acres in pasture, twelve acres in hay and twenty-two acres in wheat. You would have passed by twelve acres in corn and ten acres in oats, and might have noticed small plots of rye and potatoes near the four-acre apple orchard. You would also have seen a handful of horses, dairy cows, steers, pigs, and chickens. Christian Mellinger probably sold only a few products externally (most likely wheat, corn and butter), but his farming style was (by necessity) highly diversified. When properly managed, this type of diversity can be a powerful tool for maintaining soil fertility. However, diversity alone does not lead to healthy soils. Indeed, there is evidence that the diversified agriculture practiced by 19th century pioneers did not return nutrients to the land. By 1900, agronomists pointed out that Ohio researchers and farmers had successfully developed farm equipment, crop varieties and agricultural markets for the state, but had largely neglected techniques for building soil fertility. They pointed out that even with new fertilizers, wheat yields in Ohio had dropped by 14% since 1850: a clear sign that soils were being depleted. These agronomists emphasized the importance of using green manures and strategic crop rotations to rebuild soil fertility. Their writing suggests that careful and enthusiastic farmers like Christian Mellinger may not have heard of these practices – or simply may not have understood how important they are. In 1897, Christian passed the farm on to his son William, who maintained the focus on diverse grain crops. In 1920, William passed the farm on to his son, Harvey. 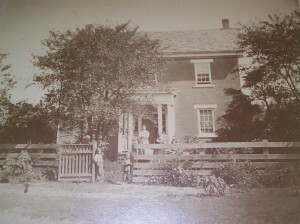 In the photograph at the top of the page, probably taken around the turn of the century, you can see William seated near the main house, with his wife Samantha behind him, his sister Belinda to the left, and his son Harvey to the right. Harvey passed away in 1941 and his nieces, Virginia and Patricia Miller, inherited the property. For the next sixty years, they rented the land to a series of farmers who used it predominantly to grow corn and soybeans. In 2002, the sisters donated to the farm to the Ohio State University for research on small to mid-scale agriculture and sustainable farming practices. Some elements of the farm’s past – especially the animal and plant diversity – are echoed in the current vision. But the early Mellingers won’t find the future research site very familiar at all. The new vision is rooted in a holistic approach to understanding agriculture that takes into account economic, social and ecological factors. On-site research on diversified farming will be steeped in cutting edge knowledge of soil fertility, nutrient management and agricultural sustainability and resilience. And it will be designed to address 21st century challenges and opportunities, including rising fuel costs, increasing global population, ongoing urbanization, climate change and burgeoning local food economies. This long-tended piece of land will continue to be a valuable asset for Ohio agriculture though research that leverages 21st century technology to grow farms that are ecologically healthy, economically resilient and socially valued for the many benefits they provide. Burkett, Charles William. History of Ohio Agriculture; a Treatise on the Development of the Various Lines and Phases of Farm Life in Ohio. Concord, NH: The Rumford Press, 1900. Mellinger, William M. “A Brief History of the Mellinger Family.” In History of Wayne County, Ohio, 876. Indianapolis, IN: B. F. Bowen & Co, 1910. Quinby, Patricia and Virginia Reed. 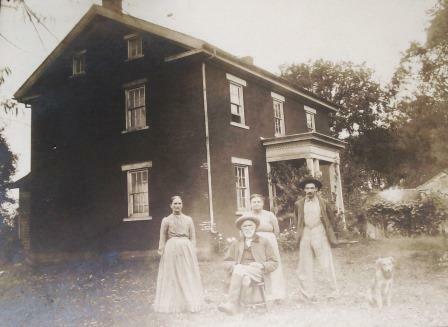 “The Mellinger Family of Wayne County, Ohio.” Unknown collection, 242., ca. 1990. Townshed, Norton S. “History of Agriculture in Ohio.” In Historical Collections of Ohio: n Encyclopedia of the State. Vol. I. edited by Henry Howe, 100-109. Cincinnati, Ohio: C. J. Krehbiel & Co. 1908. “William M. Mellinger.” In History of Wayne County, Ohio, 863. Indianapolis, IN: B. F. Bowen & Co, 1910. Ancestry.com. Selected U.S. Federal Census Non-Population Schedules, 1850-1880 [database on-line]. Provo, UT, USA: Ancestry.com Operations, Inc., 2010. Ancestry.com. U.S., Indexed County Land Ownership Maps, 1860-1918 [database on-line]. Provo, UT, USA: Ancestry.com Operations, Inc., 2010.